Schools have reopened across Sierra Leone nine months after they were closed because of the Ebola outbreak. The government hopes that the studying time lost by the country's 1.8 million children can still be made up. The United Nations Children's Fund (Unicef) says that the reopening of Sierra Leone's schools marks "a major step in the normalisation of life". New cases of Ebola continue to be reported in Sierra Leone but numbers are declining. To allay fears and ensure that there are no new Ebola cases, the first day at school has been spent on Ebola education and going through basic hygiene rules. Secondary school teacher Nancy Banya told the BBC's Newsday programme that after welcoming the children there would be a quiet time to reflect on the lives of "those friends who we lost". 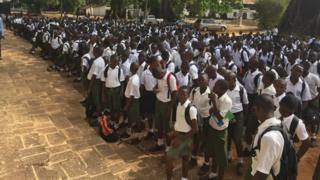 Turnout has been generally low in schools across Sierra Leone on the first day back. "There are mostly freshmen in school today," one school principal told me. He said less than 10% of the pupils reported today. Most of the schools in the east of the city reported only trickles of students. Across the country the picture is pretty much the same. At Jaiama Secondary School in the eastern Kono district just about a dozen showed up out of more than 500 on the roll. But those kids who turned up looked smartly dressed and excited to restart their life disrupted by the outbreak. Some parents have questioned what can be achieved in the remaining three months of the academic year. A mother of three school-going children told me she would rather the schools were reopened in September "when Ebola would hopefully have finally ended and better preparation made for the proper start of the school year". Unicef has trained 9,000 teachers in Ebola prevention and is also supplying hand washing facilities to every school. But some schools in the east of the country contacted by the BBC's Umaru Fofana said that they had not yet received new teaching materials or even the health and safety gear that was promised. There have been more than 12,000 Ebola cases in Sierra Leone with 3,831 people dying from the virus since the outbreak began in the country in May 2014, according to the World Health Organization. The number of new cases is declining with just six recorded last week. At the start of the school day pupils had to wash their hands with soap and clean water and have their body temperature checked before entering the classroom, our reporter says. Sierra Leone is the last of the three countries worst affected by the Ebola virus to reopen schools. Guinea reopened its schools in January and Liberia followed a month later.